This is a complete example using C. The idea is to tap into the E1 without disturbing it, decode MTP-2 on the Corelatus probe, send the decoded packets to my workstation and then use wireshark to decode the higher layers and provide a GUI. Wireshark is a popular and freely available program for debugging all sorts of protocols. Most people use it for sniffing IP protocols running on ethernet, but it has good SS7 support too. 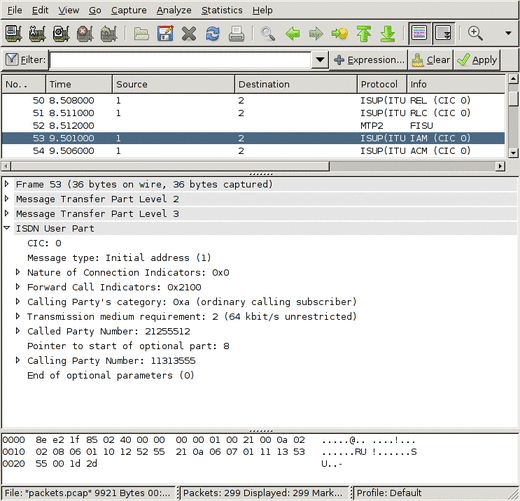 Wireshark can decode the ISUP, SCCP and MTP-3 parts of the SS7 stack. To get wireshark to display our data, we need to save it in a format wireshark understands. Wireshark's main file format is 'libpcap', the same one tcpdump and tcpflow use. The Libpcap format is clean and simple, just a short header at the start of the file and then a timestamp and length before every packet. It's documented on the wireshark wiki. That tells the probe to listen to pcm1A, timeslot 16 and send the signal units on a TCP socket to 172.16.2.1 (my workstation), port 4444. Since I want to troubleshoot a problem, I also want errored-signal-units (ESUs) saved. That file will have a 12 byte header in front of every signal unit (packet). To turn that into a libpcap-style file, discard everything except for the timestamp and length. pcm1A is the name of the first E1 interface on a probe (there are 16, pcm1A, pcm1B, pcm1C, pcm1D, pcm2A, ... pcm4D). Setting monitoring to true tells the probe to expect a -20dB (i.e. weak) signal on its E1 input. That's because the probe is connected to the E1 line through a -20dB monitor point. More about that below. The defaults are fine for the other settings, since SS7 on a 2Mbit/s E1 always uses doubleframe and HDB3. For T1, we'd need to change some values. That takes care of the software. Finally, we need to actually connect to the E1 without disturbing it. There's a standard way to tap into an E1: an ITU-T G.772 protected monitor point. It gives you an attenuated copy of the signal on the E1 so that you can listen in without disturbing the live link. Some equipment, e.g. an Ericsson AXE with an SS7/E1 line card, has an inbuilt monitor point. Or you can plug in a monitor point at a cross-connect. Many sites run all E1s through a MUX or a DXC, that way you can configure the DXC to give you a copy of the timeslots you're interested in on a separate E1 instead of using a monitor point. If you use a monitor point, you need to tell the probe that the signal is attenuated. That's what the <attribute name='monitoring' value='true'/> line above does. Leave it out if you're using a DXC. save_to_pcap.c is included (with supporting files) in gth_c_examples.zip or, if you prefer, on github. It compiles and runs on Windows and Unix-like systems. It's a complete command-line driven way to capture SS7 from E1 and SDH. Several sites use it to capture SS7 for extended periods. We also have equivalent code in Erlang, a niche language we first used at Ericsson. save_to_pcap.erl is included in (and uses other modules from) gth_erlang_api.zip. It's also on github. This file was made by save_to_pcap.c, connected to a Corelatus GTH 2.1, listening to an E1 connecting two load generators configured to start several calls per second. You can view it with Wireshark.